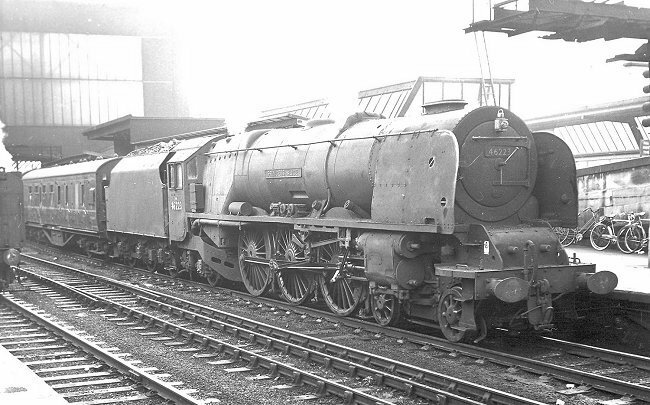 Ex-LMS Coronation class 4-6-2 number 46223 "Princess Alice" on an Up express train at Carlisle Citadel 13th July 1963. This locomotive entered service in 1937 in streamlined form. Preserved LMS Coronation class Pacific 6233 "Duchess of Sutherland" at Penmaenmawr 2nd August 2009. This locomotive entered service in 1938 in non-streamlined form. Photograph Nick Broome. 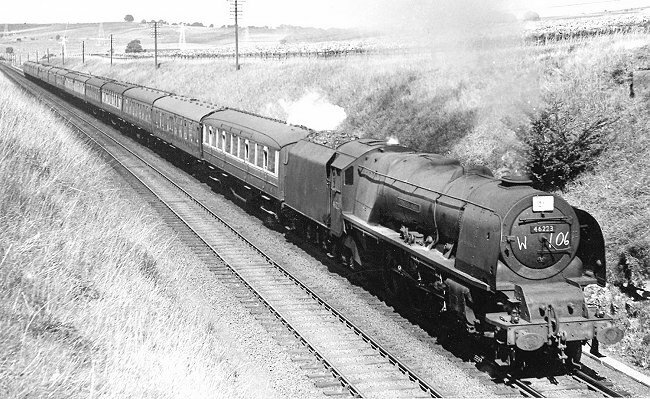 Ex-LMS Coronation class 4-6-2 number 46240 "City of Coventry" on an Up express train from Liverpool to Euston at Hanslope, near Rugby, 1st August 1963. This locomotive entered service in 1940 in streamlined form. 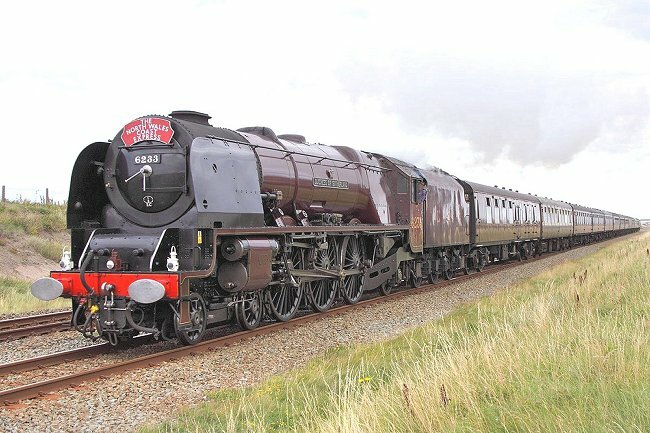 Official photograph of LMS Princess Coronation Class steam locomotive 6230 "Duchess of Buccleuch". LMS Princess Coronation Class Non-Streamlined 4-6-2 Steam Locomotive Diagram. 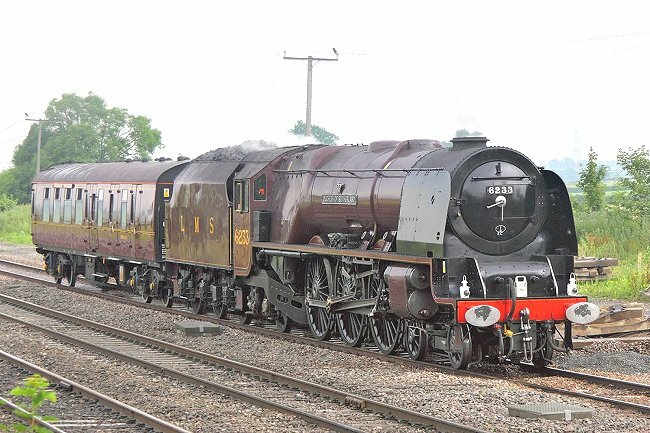 Preserved LMS Coronation class Pacific 6233 "Duchess of Sutherland" at Elford 30th June 2009. 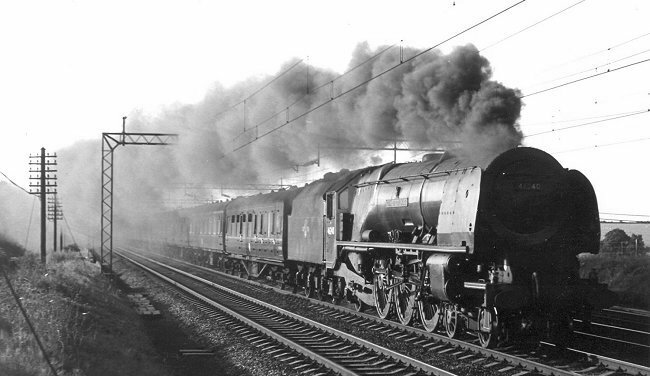 Coronation class 4-6-2 number 46257 "City of Salford" on the Up "Royal Scot" at Crewe. This locomotive was the last of the class to be built, entering service after nationalisation of British Railways in 1948 in non-streamlined form. It was one of two Princess Coronation class locomotives equipped with roller bearings. 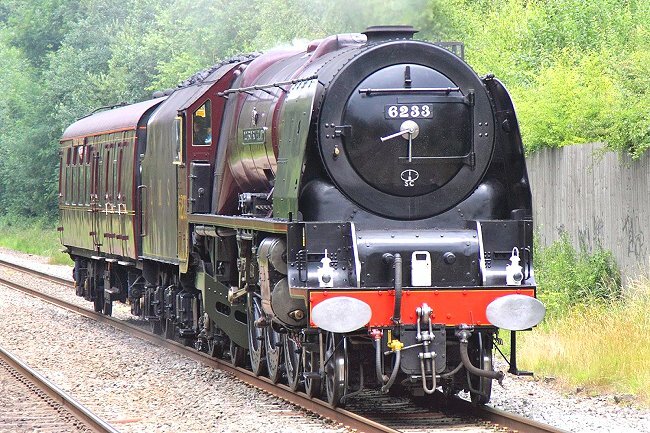 Preserved LMS Coronation class Pacific 6233 "Duchess of Sutherland" at Lapworth 30th June 2009. 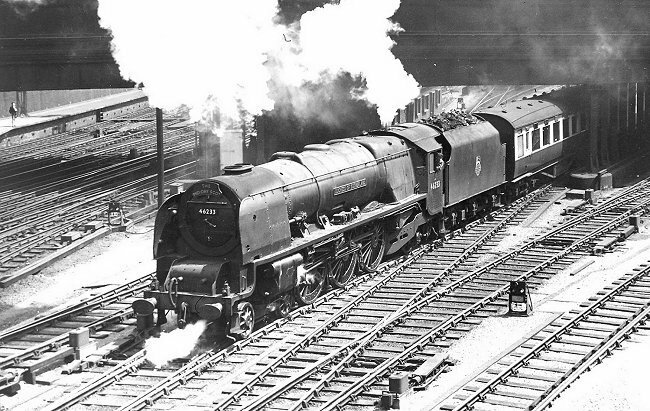 Ex-LMS Coronation class Pacific 46233 "Duchess of Sutherland" leaves London Euston with the Down "Midday Scot" on 21st July 1956. This locomotive entered service in 1938 in non-streamlined form. 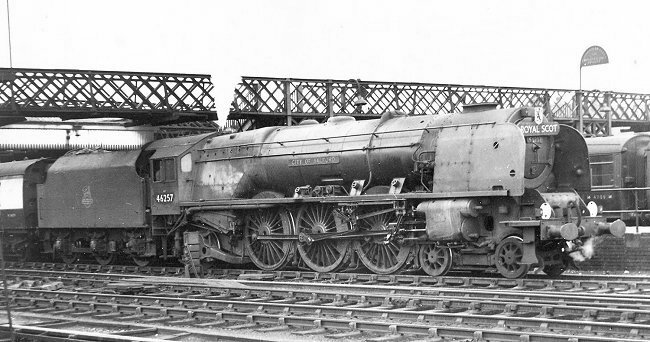 BR diagram of ex-LMS Princess Coronation Class Non-Streamlined 4-6-2 Steam Locomotive fitted with roller bearings, BR numbers 46256 and 46257. 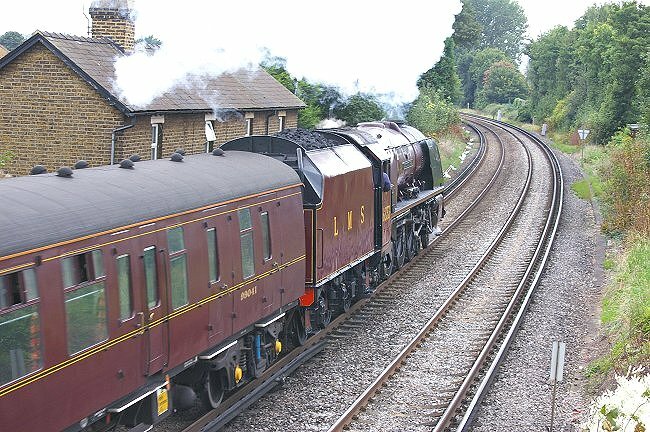 A passing view of preserved LMS Coronation class Pacific 6233 "Duchess of Sutherland" on train 1Z82 from London Victoria to Worcester 27th August 2008. Preserved LMS Coronation class Pacific 6233 "Duchess of Sutherland" at Abergele 2nd August 2009. A BR diagram of an ex-LMS Princess Coronation Pacific locomotive in rebuilt form. The locomotives were numbered 46220 to 48255. Ex-LMS Coronation class Pacific 46223 "Princess Alice" hauls train W106 southbound near Clifton & Lowther approaching Shap, south of Penrith. The first coach in the train is of LNER origin and is in BR carmine & cream livery. The light exhaust smoke demonstrates that these were powerful locomotives which were capable of hauling significant loads up Shap bank without having to be thrashed. This locomotive entered service in 1937 in streamlined form. 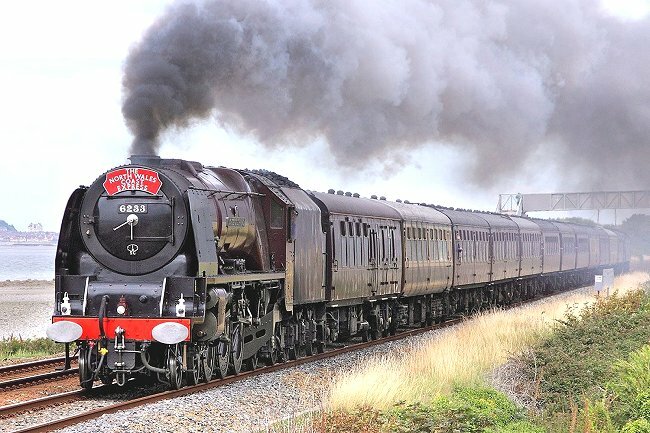 LMS 6233 "Duchess of Sutherland" features in a few photographs on this page. The locomotive was delivered from Crewe Works in July 1938, having cost approximately £13,800. The single chimney was replaced by a double one in March 1941. Smoke deflectors were fitted in September 1945. As BR 46233 "Duchess of Sutherland" the locomotive was withdrawn from service at Edge Hill Motive Power Depot in February 1964. She was then displayed for many years at the Butlin's holiday camp in Ayr before being refurbished and returned to use on the main line. 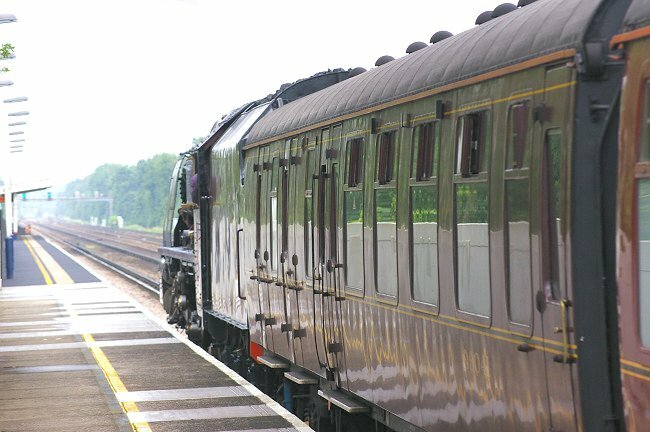 This view along preserved LMS Coronation class Pacific 6233 "Duchess of Sutherland" clearly shows how the smoke deflectors were angled. The location is Hersham 1st June 2008.